Do you feel stretched to the limit? Do the hours in your day fly by only to find out you have more on your to-do list than you do minutes left in the day? Then it's time that you start looking at your schedule and figuring out where the hours are going. 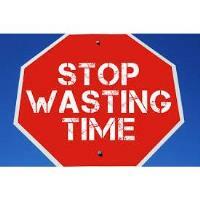 Are you guilty of these business time wasters? If you are, you're about to get some of your day back. If you're not out there sharing on a regular basis, you're wasting your time from a business perspective. In order to build an audience and get people to know, like, and trust you, you need to be on there consistently posting and having conversations. You're also wasting time on social media if all you ever do is post about yourself. Yes, you need to check social media, and yes, you must listen for mentions of your business name, the service you provide or the product you sell, or anyone who sounds like they could be a (potentially) good customer for you. You do not, however, need to be watching cat (or dog) videos, unless you are a vet and it's a cutting-edge procedure you're trying to learn more about. Studies have shown that even if you don't check email constantly, if you have notifications set on your computer, receiving an email notification is enough to distract you and take your mind off the task at hand. You will then lose time trying to reestablish your place and what you were working on. In addition to breaking your level of concentration, often people will realize their fires are not as critical as they think or they may find the answer out on their own. One of the most beneficial skills you can master in business is understanding the difference between smoke and fire. There are critical things you must drop everything to address (like a PR nightmare on social media) and then there are things that can wait (like someone asking you for a phone number they can just Google). What's your business goal? While emergencies do come up, and things that take us away from our goal happen and must be attended to, if you're spending a decent amount of your day on things that are not goal-related, you're wasting your time. Don't work just to be busy. Everything you do reflects on that goal and how important it is to you. Meetings eat up an incredible amount of time. Some people use meetings as a time to air grievances with higher-ups they rarely see. Others are too afraid to offer their true opinions in a group setting. Susan Cain wrote about how meetings are notoriously ineffective for introverts and Diesel has decided to create an uncomfortable room to keep all meetings down to 15 minutes or less. If you have meetings that could be accomplished in an email, cancel them. While you may feel it's a good idea to do some face time with employees to give them the latest update, rethink it. You're likely disrupting their day for little return. I could've placed this time waster in the area where I mentioned answering unnecessary emails but with the gaining popularity of Facebook Messenger, it needed its own spot. These forms of communication are so convenient for the person sending them. They can get a quick answer by jumping to the head of the line. But they are incredibly disruptive. Most of us feel like we need to drop everything and attend to that "face" on our phone. If you're in the middle of something important, ignore them. Attend to them in those stolen moments like waiting for a call to connect or waiting to meet with someone. And set your status to busy on the IM when you can't be interrupted. If you are still struggling with multiple meetings each day, try to schedule them on opposite ends of your day. When you place them back to back, you lose a large amount of your morning or afternoon in meetings with no productivity to show for it. This can be discouraging. Plus, with little time in between, if one runs late, you're in jeopardy of missing or not being prepared for the next one, causing you to feel perpetually behind the eight ball. Finally, if you only leave yourself 15-20 minutes between meetings, what will you actually have time to do in that space? Check email or texts? Again, that means very unproductive time. We can't create more hours in the day but we can make the ones we have more useful. In business, you should never give your time away to things that are just busy work.